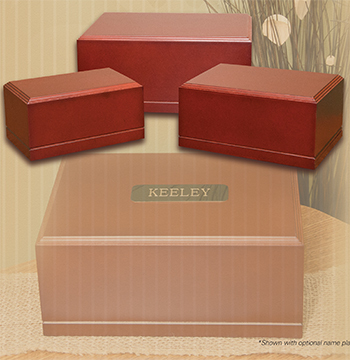 The Friendship Collection From MCS Supply Inc.
A simple yet stylish urn. The cherry colored Friendship Collection has a slide-out bottom for easy access, and is secured with one screw when closed. SMALL Urn Size 6" x 4" x 3" 39 Cu"
MEDIUM Urn Size 7¼" x 5½" x 3½" 85 Cu"
LARGE Urn Size 9" x 7" x 4" 168 Cu"